Outdoor enthusiasts, we've mapped every hill and valley for your next great adventure. 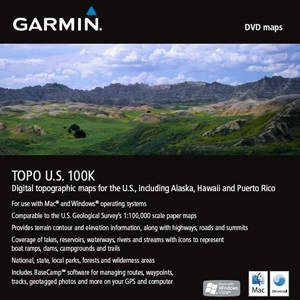 Now with more detail than ever, TOPO U.S. 100K covers the finer points of the outdoors, with topographic maps comparable to 1:100,000 scale USGS maps. TOPO U.S. 100K includes terrain contours, topo elevations, summits, parks, coastlines, rivers, lakes and geographical points.